The design of the AS.332 commenced in 1974 and the definitive prototype was preceded by a modified Puma, the AS.331, which flew in September 1977 with an uprated transmission driven by two Turbomeca Makila turboshafts. The first AS.332 flew on 13 September 1978 (the prototype designated as the AS 331) and introduced additional changes to improve payload, performance and survivability, and to reduce maintenance. Changes included a new energy-absorbing landing gear with increased wheel base and track, a lengthened nose section, more efficient fiberglass main and tail rotors, greater fuel capacity, and revised fin and tail plane contours to improve handling. In 1980 a fourth prototype introduced a cabin stretch of 0.76m with two additional windows and up to three more passengers. When development of the SA.330 (then called Alouette IV) and the production of seven test aircraft (two prototypes and five pre-series machines) was authorised by the STAe in June 1963 (the War Ministry allocated 20 million francs), Turmo III free turbines of the same rating were selected in preference to the Bastan powerplant. A full-size mock-up, seen at the Paris Air Show that year, was similar to the final version apart from the shape of the nose. The evaluation aircraft were registered F-ZWWN to F-ZFWT, and the first of them made its maiden flight on 15 April 1965; all of these, plus a sixth pre-series aircraft, were flying by mid-1968, the last on 30 July 1968. Beginning with the AS 331 prototype, this produced the AS 332A commercial pre-production models followed by the first commercial production examples designated as the AS 332C. Military pre-production models became the AS 332B followed by the initial militarized forms in the AS 332B1. The AS 332 C1 was a dedicated Search & Rescue (SAR) example equipped with six cabin stretchers and a surface search radar. The AS 332F became a militarized anti-submarine and anti-ship variant while the AS 332F1 was a base navalized Super Puma modified to contend with the rigors of the salty ocean environment. The sixth pre-production aircraft had a different nose, which was standardized on the production aircraft. As a result of the trials programme the SA330 won the approval of the French Army, which ordered 130 (designated SA.330H). After several trial examples were built the production of the Puma was started in 1968 powered by twin 1115kW Turbomeca Turmo IVC turboshafts and carrying sixteen combat troops at 260kph for a range of 555km. The first deliveries of fifty-four SA 330Bs to the French army took place in 1969, the type becoming operational the following year and the first of forty-eight Westland-built Pumas joining the RAF in 1971. Thirty of the SA.330B, which is the version for the French ALAT (Army Air Corps), were built from spring 1969. The SA.330C export version also went into production in 1969. The SA.330 may carry a 2500kg external sling load or 20 troops and is equipped with a hoist capable of lifting a 175kg load. The SA.330 carries a crew of 2. The main rotor blades fold back for stowage, and all landing wheels retract, but protrude slightly. The fully-articulated main rotor had four extruded aluminum bladesand the anti-torque rotor five-blades. The last pre-production Puma was modified by Westland for the RAF and after promising tests, a joint production agreement was reached (concluded on 2 April 1968) and Westland Helicopters built 48 SA 330E as the Puma HC.Mk I. Those which are in British and French military service are powered by two 1,185 shp Turbomeca Turmo IIIC4 turboshaft engines. They can carry a wide variety of cannon, machine-guns, and mis-siles, or be used to transport up to 20 troops or cargo. The RAF's SA.330E Puma HC Mk.1s built by Westland in 1970-71, were assigned to No.33 and 230 Squadrons. The SA.330F civil version flew in September 1969 powered by 1290shp Turmo lVA engines. It was superseded by the SA.330J, introduced in 1976, and the SA.330L for military use. Both have 1580shp Turmo IVC engines and composite material main rotor blades. The SA.330J has been certified for all-weather operation and has an anti-icing system on both the rotor blades and air intakes. The SA 330J provides for a standard crew of two on the flight deck, with a toilet and baggage compartment at the rear of the cabin. Equipped with thermal de-icing of the main rotor blades, thermal anti-icing of the tail rotor blades, special intakes and weather radar, the SA 330J, on 25 April 1978, received certification for all-weather operations, including flight in icing conditions. Aerospatiale went on to build 686 (some sources claim 697) SA 330s (before switching production to the Super Puma in 1981) in successively improved versions for numerous export customers. 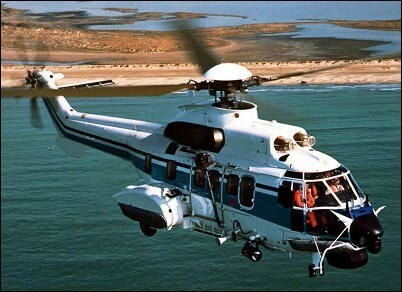 These included civil operators, especially those in the oilfield support industry once the all-weather capability was available in the SA 330J and L. Between 1970 and 1984, Aerospatiale sold 126 civil models in all. The SA330 was also assembled in Romania as the CNIAR-330, the first IAR-330H Puma flying on 22 October 1975. In 1977 a licence was granted for the Puma to be built in Romania. Romania became the sole manufacturer of the Puma helicopter, and had completed 112 by mid-1985, mostly for military use. Romania exported a number of Puma, the military customers included Sudan, which received 12 in 1985. By 1994 IAR had built over 200 and production of the IAR-330L continued. The fuselage of the SA 330 Puma is a conventional all-metal semi-monocoque structure, with the engines mounted externally on top of the fuselage shell and forward of the main rotor assembly. The rotor is driven via a main gearbox, with twin free-wheeling spur gears to combine the outputs of the two turboshaft engines to a single main drive shaft. Should both engines fail the auto-rotating main rotor continues to drive the auxiliary take-offs for the shaft-driven tail rotor, alternator, dual hydraulic pumps, and ventilation fan. The tail boom, which carries the flapping-hinge five-blade tail rotor on the starboard side and a horizontal stabiliser on the port side, is a monocoque continuation of the aft fuselage. Early main rotor blades were of light alloy construction, but those fitted since 1976 are composite units of glassfibre, carbon fibre and honeycomb construction, with anti-abrasion leading edges of stainless steel. The landing gear is of the semi-retracting tricycle type, with twin wheels on each unit, all of which are partly exposed when retracted. The first SA 330Bs for the French army and air force, and the SA 330Es for the Royal Air Force, were powered by Turmo III C4 turboshaft engines with a take-off rating of 990kW; and the SA330C/H military export versions, first flown in September 1968, had originally 1044kW Turmo IVBs, but from the end of 1973 SA 330H aircraft were equipped with 1174kW Turmo IVC engines which include anti-icing of the engine air intakes. The first SA 330F/G civil versions had Turmo IVA engines of 1070kW as first flown on 26 September 1969 and delivered from the end of 1970; but the SA 330G acquired Turmo IVC engines from the end of 1973; and this is also installed on the SA 330J (civil) and SA 330L (military) helicopters of 1976. A four-blade main rotor, with a fully articulated hub and integral rotor brake. Attachment of each blade to its sleeve is by two quick-disconnect pins enabling the blades to be folded back manually. The five-blade tail rotor on the starboard side of the tailboom has flapping hinges only, with mechanical shaft and gear drive. The main gearbox is on top of cabin behind engines, and has two separate inputs from the engines and five reduction stages. Drive to the tail rotor is via shaft and an intermediate angle gearbox, and a right-angle tail rotor gearbox. The hydraulically controlled rotor brake, on the main gearbox, allows the rotor to be stoped 15 seconds after engine shutdown. Each of the moulded blades is made up of a fibreglass roving spar, a composite fibreglass and carbonfibre fabric skin, with Moltoprene/honeycomb filler. The leading-edge is covered with a stainless steel protective section. The fuselage is an all-metal semi-monocoque structure. Titanium alloy is used under the engines, which are outside the main fuselage shell. The monocoque tailboom supports the tail rotor and a horizontal stabiliser on the port side. The Messier-Hispano-Bugatti semi-retractable tricycle type landing gear, with twin wheels on each unit retract upward hydraulically into fairings on sides of fuselage and a self-centring nose unit retracts rearward. The wheels have hydraulic differential disc brakes, controlled by foot pedals, and a lever-operated park brake. The two Turbomeca Turmo IVC turboshaft engines are mounted side by side above cabin forward of the main rotor assembly and separated by a firewall. They are coupled to the main rotor transmission box, with shaft drive to the tail rotor, and form a completely independent system from the fuel tanks up to the main gearbox inputs. Fuel is in four flexible tanks and one auxiliary tank beneath the cargo compartment floor, with a total capacity of 1,544 litres. There is provision for an additional 1,900 litres in four auxiliary ferry tanks to be installed in the cabin. External auxiliary tanks (two of 350 litres each) can be fitted. For long-range missions one or two extra internal tanks of 215 litres each can be fitted in the cabin. Each engine is supplied by a pair of interconnected primary tanks, the lower halves of which have self-sealing walls for protection against small calibre projectiles. Crew can be one, or two side by side on anti-crash seats on the flight deck, with a jump-seat for third crew member if required. Doors feature on each side of flight deck on later versions. An internal doorway connects the flight deck with folding seat in the doorway for an extra crew member or cargo supervisor. Dual controls standard. Accommodation in main cabin for 16 individually equipped troops (20 in the high-density version), six stretchers and six seated patients, or equivalent freight. The floor is strengthened for cargo-carrying, with lashing points. The main cabin can have jettisonable sliding door on each side or a port-side door with built-in steps and starboard-side door in VIP or airline configuration. A hatch in the floor below the centreline of the main rotor is provided for carrying loads of up to 3,200kg on an internally mounted cargo sling. A fixed or retractable rescue hoist (capacity 275kg) can be mounted externally on the starboard side of the fuselage. The cabin can have a baggage compartment and/or toilet facilities in the rear of cabin. Two independent hydraulic systems, each 172 bars, are supplied by self-regulating pumps driven by the main gearbox. Three-phase 200V AC electrical power is supplied by two 15 kVA 400Hz alternators driven by the port side intermediate shaft from the main gearbox and available on the ground under the same conditions as the hydraulic ancillary systems. 28.5V 10kW DC power is provided from the AC system by two transformer-rectifiers. A main aircraft battery is used for self-starting and emergency power in flight. De-icing of engines and engine air intakes is by warm air bled from compressor. The search and rescue version has nose-mounted Bendix RDR 1400 or RCA Primus 40 or 50 search radar, Doppler, and Decca self-contained navigation system, including navigation computer, polar indicator, roller-map display, hover indicator, route mileage indicator and groundspeed and drift indicator. A wide range of armament can be carried, including side-firing 20mm cannon, axial-firing 7.62mm machine guns, missiles and rockets. The design of the AS.332 commenced in 1974 and the definitive prototype was preceded by a modified Puma, the AS.331, which flew in September 1977 with an uprated transmission driven by two Turbomeca Makila turboshafts. The first AS.332 flew on 13 September 1978 and introduced additional changes to improve payload, performance and survivability, and to reduce maintenance. Pro-duction began in France in 1981, and is also undertaken by IPTN in Indonesia under license from Aérospatiale. Samco assembling 17 AS.332Ms under licence for the Republic of Singapore Air Force, and CASA planed to assemble 12 AS.332Bs for the Spanish Army in 1988/89, both joining fleets of French-built helicopters. A total of 197 military Super Pumas had been ordered by May 1987. There are versions of the Super Puma based on short and long fuselage variants. The short fuselage AS.332B is the standard 23-seat tactical transport military version and the short fuselage AS.332F is a naval variant. The AS.332F features a fold-ing tail-rotor pylon, a deck-landing assistance device, additional corrosion protection, a nose mounted Omera 360 deg scan search radar, and sonar equipment. Anti-ship armament comprises two AM.39 Exocets, six AS.15TT, or a mix of one Exocet and three AS.15TT. The AS.332F can also be configured for search and rescue. The civil equivalent of the AS.332B and F is the AS.332C. There is a stretched AS.332M 25-seat military transport. The stretched AS.332L civil version of the AS.332M is in wide use with 34 with Bristow Helicopters, redesignated Tigers to signify equipment differences from the standard AS.332L. 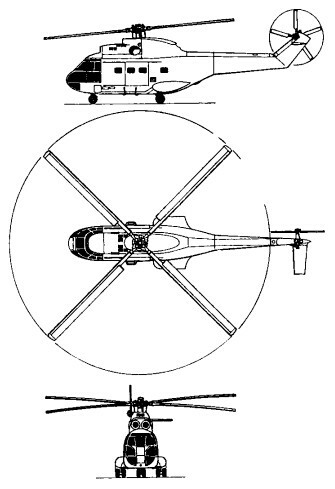 Aérospatiale was devel-oping the AS.332 Mk.II incorporating advanced rotor systems, including lengthened blades with parabolic tips, an uprated gearbox to allow increased power transmission, and upgraded avionics and equipment. Performance and manoeuvrability improvements over the standard AS.332 are significant, and uprated engines give a better hot/high capability. The first Super Puma Mk.II flew on February 6, 1987. The 2002-build Eurocopter AS.332L2, a modified Super Puma, had the latest glass cockpit technology with a four- axis coupled autopilot for IFR, day/night approaches and SAR search modes. HIF, VHF/FM, UHF and homing devices make up the extra avionics, whilst an Ultraforce 11 FLIR camera is under the nose, a 30 million candela Nitesun on the lower starboard fuselage and a Skyshout system is also installed. A comprehensive set of medical equipment is carried, including a heart monitor and defibrillator. Externally, the Super Puma shares many of its characteristics with the preceding Puma design. Its engines are mounted forward and high atop the fuselage exhausting outwards above the crew cabin. The engines power a four-bladed composite construction main rotor and five-bladed tail rotor mounted to starboard. The pilot and co-pilot are fitted into a glazed forward-mounted canopy with excellent views in all vital directions. Each pilot is afforded an automobile-style door for easy entry and exit. The fuselage sides are dominated by two large cabin doors (one door to a side) with cabin windows. The undercarriage is full retractable and features two main landing gears (single-wheeled) recessing into low-mounted fuselage side sponsons as well as a nose gear fitting two wheels recessing behind and under the cockpit floor. Like the Puma series before it, the Super Puma features an elevated empennage with a single vertical tail fin and a horizontal tailplane jutting out of the portside of the fin. The AS 332L first flew on October 10th, 1980, appeared as a new civilian production model and sported a lengthened fuselage for an increase in its cabin space and fuel capacity as well as uprated turboshaft engines. Operations of the type were certified in 1983. The AS 332L1 was a similar model featuring an even more lengthened fuselage containing an airliner-type interior and uprated Makila 1A1 turboshaft engines and made its operational appearance in 1986. The AS 332M became a militarized version of the AS 332L model while the AS 332M1 was a similar militarized AS 332L with a lengthened fuselage. The AS 332L2 "Super Puma Mk II" was a further civilian-based transport development of the type beginning service in 1993 and featuring a long-fuselage for an extra row of seats. These Super Pumas were also given a spheriflex rotor head with EFIS flight instrumentation as well as longer main rotor blades with parabolic tips and a four-axis Automatic Flight-Control System (AFCS). The cockpit was updated to include four large multi-function LCD screens. Passenger seating is between 19 and 24 persons. A 15-passenger VIP model (Super Puma Mk II VIP) is also available complete with galley and toilet. The AS 332L1 utilized twin Turbomeca Makila 1A1-series turboshaft engines running at 1,742 shaft horsepower each while the AS 332L2 fitted twin Turbomeca 1A2-series turboshaft engines rated at 1,819 shaft horsepower each. Top speed for the AS 332L1 was 278 kilometers-per-hour with a range of 841 kilometers and a service ceiling of 20,000 feet. Rate-of-climb was listed at 1,618 feet-per-minute. Comparatively, the AS 332L2 operated at a top speed of 278 kilometers-per-hour, a range of 831 kilometers, a service ceiling of 23,622 feet and a rate-of-climb of 1,614 feet-per-minute. The AS 332L has seen extensive production and use during its run. These are now being replaced by the newer AS 332L2 Super Puma MK II series. Bristow Helicopters acquired no fewer than 31 custom AS 332L's for its North Sea-based offshore oil rig work. Customizations included folding cabin seats, life rafts, jettisonable cabin doors, IFR instrumentation, de-icing equipment, baggage compartments and North Sea-related navigational aid equipment. These came under the designation of "Tiger" (sometimes called "Super Tigers"). Indonesian Aerospace (formally IPTN) has license-produced the Super Puma as the NAS 332L1 of which at least 7 were sold to Iran in a 1996 deal. Following on from the Alpha XH-1 research, Denel comimssioned two Puma helicopters to develop the systems required for the Rooivalk. Puma J1 first flew in 1986 and was the primary avionics, weapons and flight control systems’ test bed. Puma J2 flew shortly afterwards, its primary task being to develop the weapons systems and integrate them with the aircraft and the other on hoard systems. Concurrently two missile tests were conducted: the first stud-ied the effect of missile blast on the tail boom and the other studied the accuracy of the weapons and associated systems. From the J model Pumas the Rooivalk started to take shape in the form of the ini-tial experimental development model (XDM). Production of the original Puma totalled over 686. Medium-lift 20-troop military helicopter with retractable tricycle u/c and four-blade main rotor driven by two 1320shp Turbomeca Turmo III.C4 turboshafts positioned in housing above main cabin. Prot. F-ZWWN FF 14 Apr. 1965. Jointly built by Aerospatiale and Westland. Originally named Alouette IV. Initial military production version; delivered to ALAT (French Army Air Corps) from 1969; two 984kW Turmo IIIC-4 turboshaft engines. First flown January 1969. Prototype for battlefield surveillance version, fitted with ESB Orchidee 360° radar and datalink system. Military export version; similar to SA 330B with provision for fixed or retractable undercarriage; some fitted with surveillance radar and flotation gear. Westland-built version for Royal Air Force, designated HC Mk 1. Forty built. First civil version with 1,070kW Turmo IVA engines. First flown 26 September 1969; French certification 12 October 1970; FAA IFR certification 23 June 1971. Uprated SA.330F model for civil and military markets; two 1,174kW Turmo IVC engines; composite main rotor blades. Export version of Puma SA.330G for ALAT and military customers. Puma SA.330G with composite main rotor blades and higher weights introduced in 1976. Some assembled by IPTN in Indonesia. Puma SA.330H with composite main rotor blades and higher weights introduced in 1976. Portuguese SA.330C modified by OGMA with composite main rotor and two 1700shp Turbomeca Makila I turboshafts. Puma SA.330 fitted with experimental tail fenestron. Prot F-ZWRR. Puma Licence-built in Romania by IAR Brasov with 1588shp Turbomeca Turmo IV-CA turboshafts. Stretched Puma SA.330 used as development aircraft for SA.332 Super Puma with two 1755shp Turbomeca Makila turboshafts and redesigned rotor head. Also known as SA.330R. F-ZWWO First flown on 5 Sept. 1977. Upgraded Puma by Denel (Atlas Aviation) in South Africa. Atlas has conducted the development and production of a variant of the SA 330 Puma helicopter as the Oryx, and development of a modular weapon suite for the Puma helicopter to convert it into a gunship. Payload: 24 Pax / 2722 kg int. / 4500 kg ext. Engine: 2 x Turbomeca Turmo IV C.